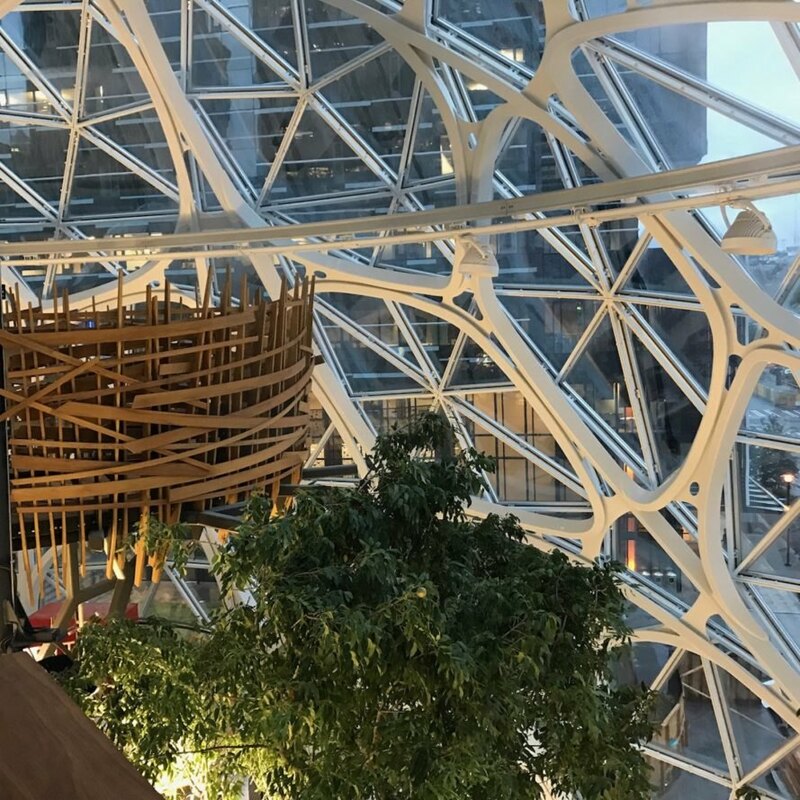 Amazon has finally opened its stunning new downtown Seattle office, and it’s unlike any workspace we’ve seen before. 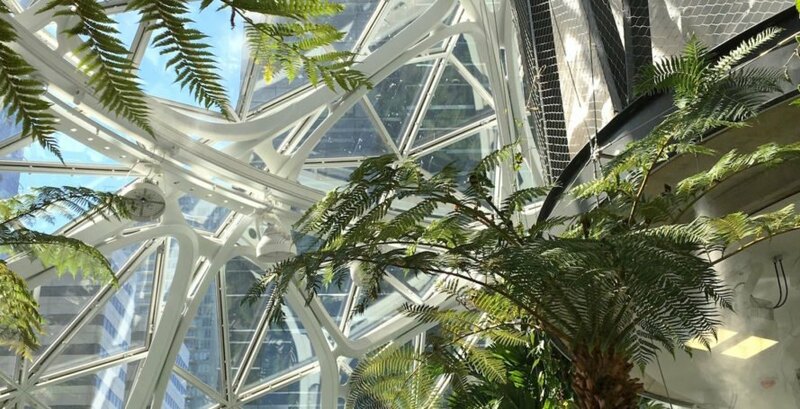 The Amazon Spheres, which celebrated their grand opening yesterday, are three glass geodesic domes that provide office and greenhouse space. Designed by NBBJ, the “mini-rainforest” campus will house over 800 Amazon employees in addition to more than 40,000 plants in an ecosystem built to emulate a verdant cloud forest. 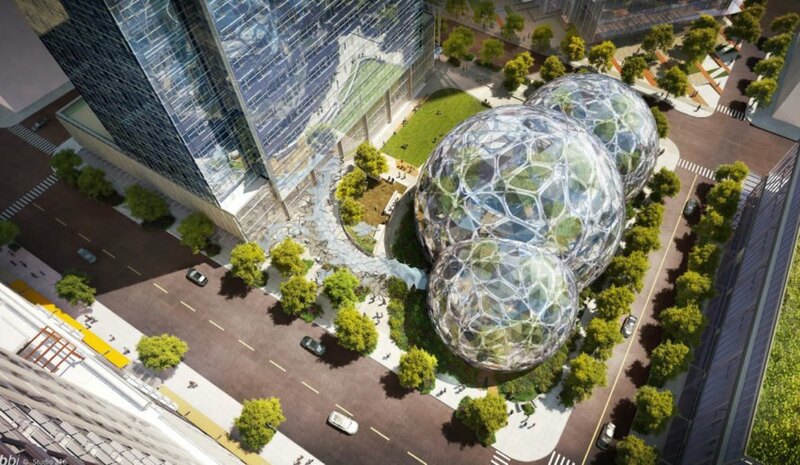 Located at the corner of Lenora Street and 6th Avenue, Amazon’s giant geodesic domes are made with a steel frame holding 2,643 laminated glass panels made up of four-layered low-iron glass to minimize heat loss. The largest of the three domes measures 90 feet tall and 130 feet in diameter with five floors (and a four-story-tall living plant wall that grows 200 plant species). Retail space occupies the ground floor and part of the first floor. Over 400 species of plants from more than 30 countries are represented in the domes and are cared for by a full-time horticulturalist. Nearly all of the plants were grown in a suburban greenhouse for the Spheres project. The flora centerpiece is a 55-foot-tall Ficus tree (nicknamed Rubi) that weighs almost 36,000 pounds and was craned into the space through the roof. The plantings are mostly organized in either the Old World garden that features African and Asian plants, or in the New World garden with a focus on the Americas. An architectural highlight is undoubtedly the “bird’s nest,” a timber treehouse suspended 30 feet in the air that serves as an intimate meeting space. The interior temperature will be stabilized at 69 to 72 degrees Fahrenheit with 60 percent humidity, and the climate will vary throughout the space. Recycled heat from the nearby data center is used to heat the Spheres. The project is on track for LEED Gold certification. The public is welcome to take a free tour of the facilities but must first book with Spheres Discovery at Understory. Amazon has finally opened its stunning new downtown Seattle office and it’s unlike any workspace we’ve seen before. 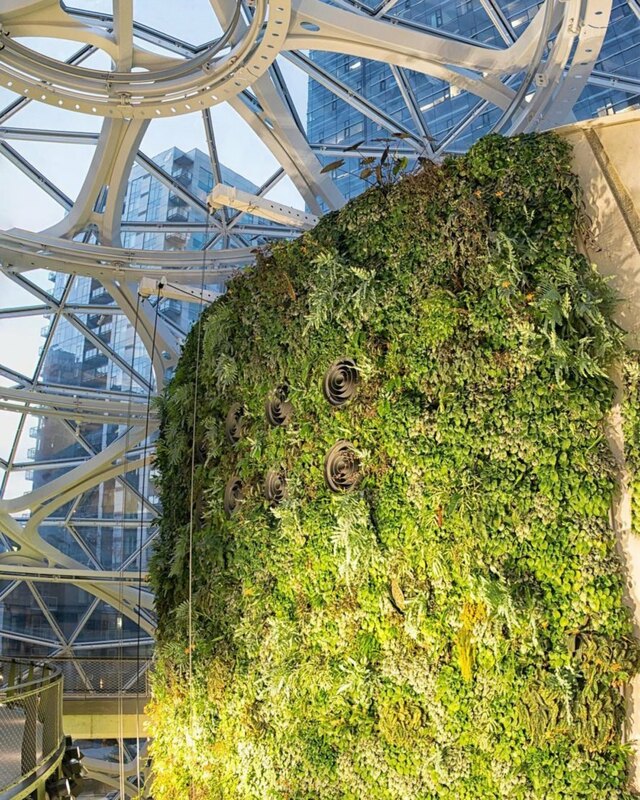 Amazon Spheres, which celebrated its grand opening yesterday, is part greenhouse and part office housed within three glass geodesic domes. 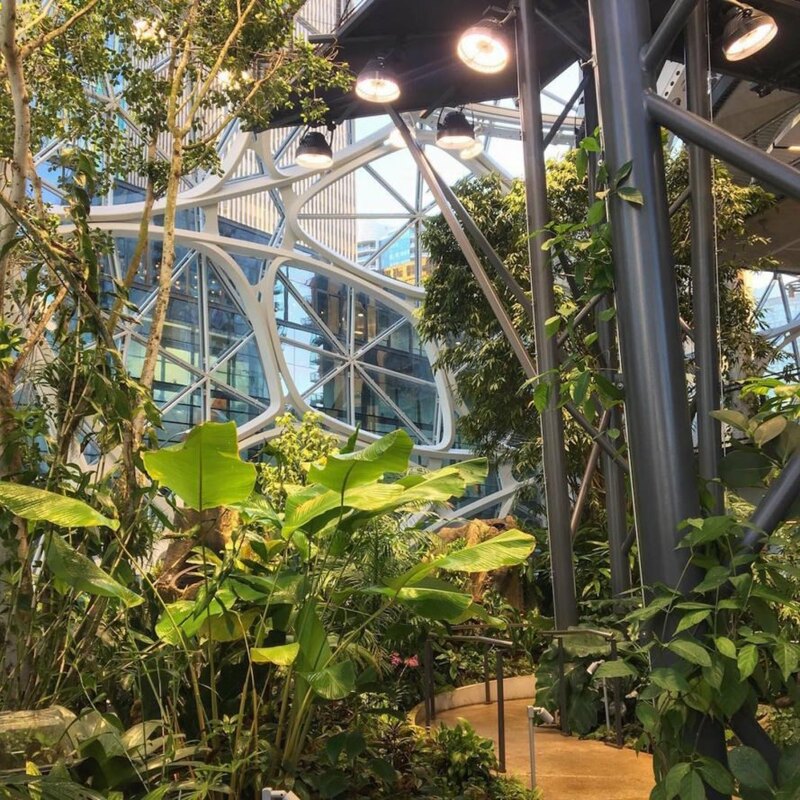 Designed by NBBJ, the “mini-rainforest” campus will house over 800 Amazon employees in addition to more than 40,000 plants in an ecosystem built to emulate a verdant cloud forest. 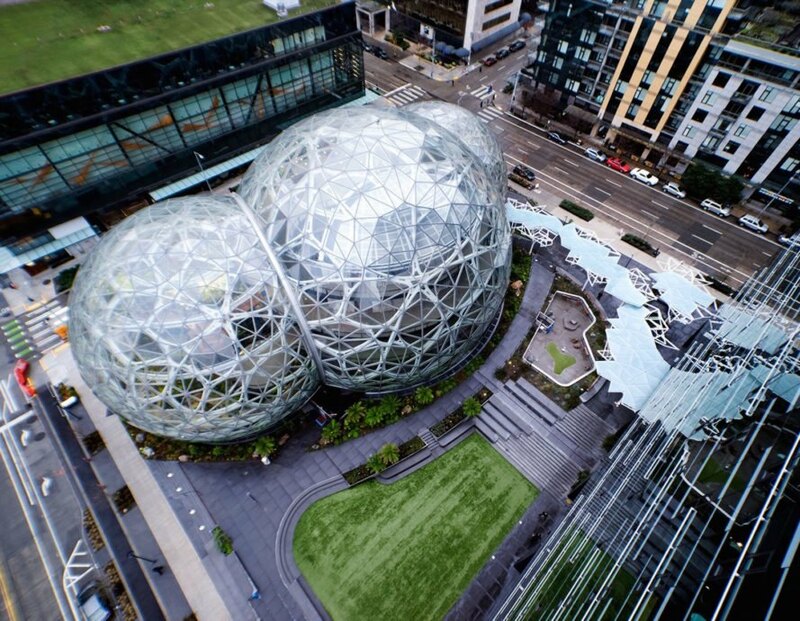 Located at the corner of Lenora Street and 6th Avenue, Amazon’s giant geodesic domes are made with a steel frame holding 2,643 laminated glass panels made up of four-layered low-iron glass to minimize heat loss. The largest of the three domes measures 90 feet tall and 130 feet in diameter with five floors (and a four-story-tall living plant wall that grows 200 plant species). Over 400 species of plants from more than 30 countries are represented in the domes and are cared for by a full-time horticulturalist. An architectural highlight is undoubtedly the “bird’s nest,” a timber treehouse suspended 30 feet in the air that serves as an intimate meeting space. The interior temperature will be stabilized at 69 to 72 degrees Fahrenheit with 60 percent humidity, and the climate will vary throughout the space.